I am one of millions of viewers who tune in every week to watch the Great British Bake Off. I enjoy everyday bakers inspiring me with their own baking creations, and watching how they embrace the technical challenge. So when I was asked to review the latest book accompanying the show The Great British Bake Off How to Turn Everyday Bakes into Showstoppers not even Paul Hollywood could stand in my way. But wait - this season it's not just a book where you will find recipes from the show. No, this year for the first time there is a Great British Bake Off iPhone App too! Eek how every exciting, I confess to downloading mine a month ago. The book contains seven recipe chapters Cakes, Biscuits, Breads & Sweet Dough, Tarts, Pies, Desserts, Puddings. There is also a Basics chapter to help you with fillings, decorations, techniques and tips. Each chapter starts off with a basic recipe, great for inexperienced bakers. The recipes then build up in technical skills to a Showstopper recipe, which you are sure to recognise from the show. You will also find recipes for the technical bakes, including Paul Hollywood's infamous Plaited Loaf, you remember the one, it got many of the contestants in a twist. I'm sure you want to know how I got on with baking a recipe from the book. I chose the Honey Madeleines which I baked at the weekend. The recipe instructions were well laid out and easy to follow and the bake turned out wonderfully. I've got my eye on the Chess Cake recipe and Swan Lake a Choux pastry recipe for next time. The contestants recipe's, its great to have a chance to reproduce a true showstopper. Some we have already seen on the show and some that have yet to be broadcast. There is a great 'tips' and 'don't forget' suggestions in the book, not just usable with the recipes. These hints will usefully help you save time and create new idea's for your own baking. The paper in the book is produced from responsible sources. Photographs illustrating the recipes are well presented, the only thing I would say is not all recipes are accompanied by a photograph. I find I get quite tempted with a recipe by a good photograph, so would rather have seen more photos of the lovely recipes than a pretty cushion. I'd quite like to know more about the contestants, such as their favourite bakes, what got them into baking? As I mentioned earlier I already download The Great British Bake Off app quite some weeks ago. 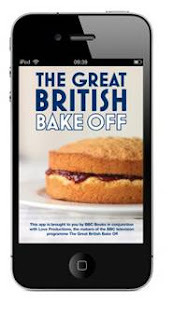 It contains a staggering 50 recipe's based on the Great British Bake Off books, all at your finger tips no matter where you are. It has some very useful functions, you can search for recipes by ingredient, occasion, difficulty or even baker. Each recipe includes details of what ingredients and equipment you will need. You can add the ingredients to a shopping list, which you can then add your own additional items creating your main shopping list and not just a recipe shopping list. There is also something very special about this app it has a touch free function for when you are baking and have messy hands. You slowly glide your hand over the top of the screen and the next set of recipe instructions appear. No need to get sticky marks on your screen, how clever is that. Now once you have baked your recipe of course you want to share it with everyone. Simply tap the camera icon to take a photo, and tap share and before you know it everyone on Twitter or Facebook can share your success. It even automatically adds the #GBBO tags. This is a great app for all keen bakers, I will be interested to see how the app develops over time. What extra functions or recipe's will the team at The Great British Bake Off come up with next. 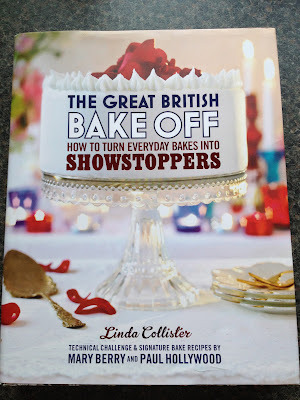 Disclosure: I was sent a copy of The Great British Bake Off How to Turn Everyday Bakes into Showstoppers book for the purposes of an honest review. Its the first series that I have watched of the show, the book is on my christmas list. These look fab! I agree I dislike it when a recipe has no photo.